Four of Huw’s friends are involved with the Heavy Arts Theatre School in Huddersfield; Lawrence Güntert, Hayley Diamond, Tara Atkinson and Caroline Hamilton. 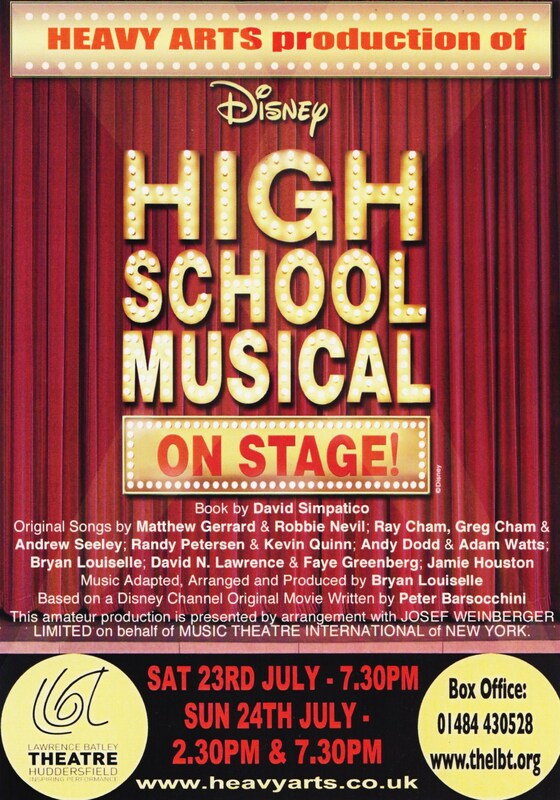 Their next production is ‘High School Musical On Stage!’ on 23rd and 24th July. Lawrence Güntert has known Huw since they started school together at Upperthong Junior School 11 years ago. Lawrence was a close friend of Huw’s for years and they stayed good mates throughout High School. Lawrence’s talents lie on the stage and with music. Huw met Hayley, Tara and Caroline 4 years ago at Holmfirth High and he became close to them over the years. They were all at the 5 a side football competition in June along with other things over the last few months. At the performances the Theatre School will be collecting for The Huw Thatcher Trust. Many thanks to Lawrence and Lyn Güntert for setting this up and getting it included in the programme. Heavy Arts Theatre School is made up of some extremely talented young people and their shows are always a great success. If you want to go along and see for yourself the stars of the future tickets can be ordered on line through the Lawrence Batley website, www.thelbt.co.uk, or from Lawrence, Hayley, Caroline and Tara. Prices range from £5 to £12.